Most investigators agree that efflorescence is caused by multiple factors in combination with the climate and environmental conditions. Views, however, on which factors are the major culprits in causing the problem are not understood or agreed upon between most experts. One thing that most all agree is that efflorescence is a soluble alkali salt, usually sodium and potassium sulfates, but expressed as Na2O and K2O equivalents, that exude from masonry as a solution. 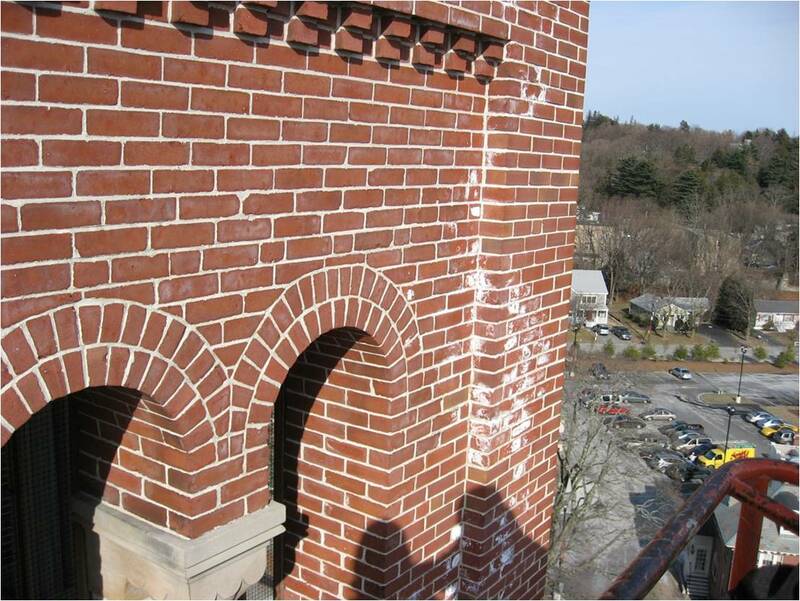 Upon drying the solution re-crystallizes as a supersaturated solution on the surface of the masonry causing a unsightly white film, coating or scum that can accumulate. There are temporary and permanent forms of the condition. The temporary form is often called “new building bloom” and is short-lived, but there are permanent forms as well – disappearing as a result of rain only to reappear again and again for many years. It is this type of permanent efflorescence that can cause damage to masonry buildings by disintegrating mortar and spalling masonry units. Some causes of efflorescence can be directed to the contractor and his practices at the jobsite. For instance, if brick or stone is not covered up and become saturated with water prior to installation; failure to protect unfinished walls from rain; unprotected parapet and or lack of proper flashing; lack of adequate drip edges on sills and cornices; leaky temporary gutters and downspouts; poorly filled mortar joints; chronic damp condition at grade where masonry doesn’t have a chance to dry out quickly after construction. Brick can have varying levels of alkali salt content as well depending on the clay or shale deposit. Clay and shale deposits vary greatly in the amount of these salts. Some brick manufactures may use barium sulfate to reduce the tendency of efflorescence, but this offers no real guarantee. Generally the denser the brick the harder the unit – the less likely the efflorescence factor. Concrete block may in some cases cause temporary efflorescence when the free lime that is liberated in the hydration of the cement carbonates on the surface of the unit. This type of efflorescence is only temporary and usually will wash off in the first rain. Mortar materials are made from clay and shale and can also pose the ability to deliver salts to the surfaces of finished masonry walls. Portland cement and masonry cements vary greatly in their raw material make up. Cement is derived from limestone or marl of 70-90% total carbonate content, much of which is argillaceous and earthy. Some cement is made with alkali contents over 1% and in the finished product these salts will approximate these same percentages. These cements when used in conjunction with some of the malpractices previously mentioned can cause serious efflorescence. Most non-hydraulic limes on the other hand are extremely low in soluble salts as well as sulfur content. To give you an idea, most historical limes used in building construction were made from high-calcium limestone averaging over 97% carbonate content. Total alkali content average of 0.1%. Today, most limes are made from Dolomitic limestone with even less than 0.01%. What’s interesting is that often the lime gets the blame for the efflorescence due to its color when in fact it is 10 times less likely to cause the condition than cement or even hydraulic lime. Hydraulic lime (NHL 2, NHL 3.5 and NHL 5) are still widely produced and used in Europe and some parts of the United States and can have alkali contents usually much higher, approximating cement on an average, since these limes are made from impure, siliceous limestone. The sand aggregate may contribute to the efflorescence if the sand was not washed or if it was dredged from the areas were there might be contamination of sea water. However, most masonry sands are well-graded and have near zero potential for causing any issues related to efflorescence. In spite of considerable research into the causes of efflorescence and the ways to eliminate it, or at least minimize its occurrence, many of the research findings are conflicting and controversial. Because there are so many different potential causes that this apparent disagreement is not surprising. Although the occurrence of efflorescence cannot be predicted, it is more prone to appear suddenly, like a “disease” in a dry period during cool weather following a sustained rainy period. It does not rear its ugly head in hot dry summer months due to rapid wetting and drying of masonry walls, but in the northern climates of the United States it is apt to occur most often in late fall or early spring after rainy periods and when evaporation is slow and temperatures are relatively low. This entry was posted on November 17, 2011, 11:19 am and is filed under Uncategorized. You can follow any responses to this entry through RSS 2.0. You can leave a response, or trackback from your own site.